LITTLE ROCK, Ark. – Following regional voting, the Little Rock Touchdown Club, in conjunction with the Great American Conference, revealed the nine finalists for the 2018 Harlon Hill Trophy, the NCAA Division II College Football Player of the Year. The NCAA Division II sports information directors selected the finalists through a round of regional voting. The nine finalists will now be placed on the national ballot where all 166 of the division’s SIDs will select the award’s 33rd winner. The top two players from Super Region 1, Super Region 2 and Super Region 4 advanced to the national ballot, while Super Region 3 saw three players make the final ballot, due to a tie in the voting. Two quarterbacks – Bowie State senior Amir Hall and Valdosta State sophomore Rogan Wells – moved on from Super Region #2. 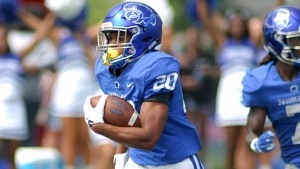 A pair of signal callers – Ferris State junior Jayru Campbell and Emporia State senior Braxton Marstall – joined Southern Arkansas senior receiver Ka’Ronce Higgins as the finalists from Super Region #3. Five of the finalists helped guide their teams into the 2018 NCAA Division II playoffs and three – McLaughlin, Campbell and Wells – will compete in this weekend’s quarterfinal matchups. The Hill Trophy is named for the late Harlon Hill – the former University of North Alabama standout – who excelled with the Lions from 1950-53 before going on to fame in the National Football League with the Chicago Bears.